.45 caliber, 7.5" barrel, serial number 1504. German silver front sight, early italic barrel address, two-line patent markings on left side of frame; with an obviously incorrect .22cal stamped on frame at rear of trigger guard. Varnished deluxe burled walnut grips. Blued barrel, ejector, cylinder, backstrap, triggerguard and trigger. Hammer and frame are case colored. The revolver is housed in a mahogany factory casing that is partitioned and lined in purple velvet with wood cartridge block holding 56 original cartridges. All cartridges unspent. We interpret Franklin’s admonition for Ruger to “give it a good test” to be a sort of inside joke from one friend and seasoned vet to another. Both Franklin and Ruger had been career military men, thoroughly familiar with the arms of the Federal government. For Ruger to have missed the stamping .22cal would have been inconceivable. 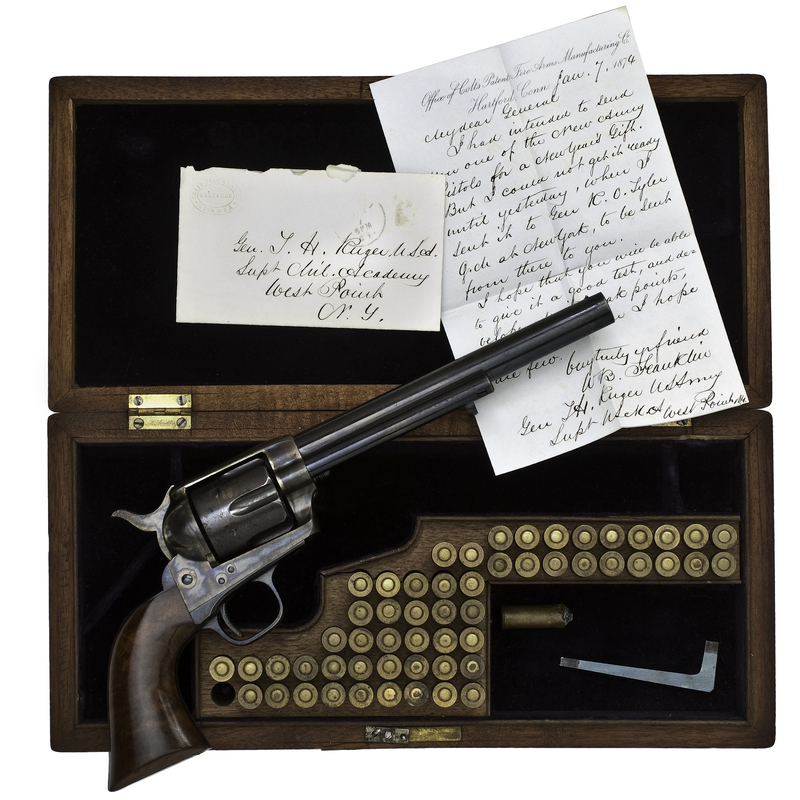 In addition, at the time of the gift, the U.S. Army Quartermaster had just signed a contract with Colt for 3,000 of the new single-action .45 caliber pistols. More than likely Ruger never fired the revolver; it appears to be in untouched condition. An outstanding, and historically important weapon. Barrel and ejector rod housing retain ca 97% original blue with some light wear at left side of muzzle and scattered very light pinprick-size brown spots. Cylinder finish is a pleasing mixture of blue thinning to brown. Backstrap and triggerguard retain ca 95% original blue with some very minute flaking. Frame and hammer retain ca 98% original case color. Grips retain most of the original varnish with some tiny nicks on the bottom. Top of case lid has an age crack. Left side of case has some dings. Case still retains most of the original finish. The heirs pried the lid open to find what was inside. Since they did not have a key, there is evidence of their actions. The top latch pulled way and could be easily restored. The interior is in excellent condition. The outline of the revolver shows and the hammer has cut into the lining. The outline of the cartridges can be seen inside the lid.